Most people know about the famous Palace Museum (Forbidden City) in Beijing, but it is a little-known fact that the treasured imperial collections of the palace are housed separately in Beijing and Taipei. For this reason, in the past six decades, most Chinese mainlanders have never had a chance to see the collections in Taiwan. But the times are changing. This spring, the season of new life, has brought with it some good news for all lovers of cultural relics. Officials from the Palace Museum and Taipei's "National Palace Museum" have been busy with mutual visits recently and are heralding in a new era of cultural cooperation across the Taiwan Straits, beginning with the sharing of relics for a Taipei exhibition later this year. On February 14-15, a seven-member delegation from the Taipei museum led by Curator Chou Kung-shin, made a historical visit to the mainland, during which she met Zheng Xinmiao, Curator of the Palace Museum in Beijing, the first step in the meeting between top officials of the two museums. This was followed two weeks later by a 10-person delegation led by Zheng to Taipei, reciprocating the February visit of their Taiwan counterparts. The major topic of the mutual visits concerned the exhibition related to Emperor Yongzheng (1722-35) of the Qing Dynasty (1644-1911), which was scheduled to be held in this October in the Taipei museum. For this exhibition, the Taipei museum needs to borrow the portraits of Emperor Yongzheng and his concubines from the Beijing one. At the press conference jointly held by the two museums in Taipei, the two sides announced that 37 relics from Beijing will travel to Taiwan to be part of the items in the October exhibition. This means that after 60 years these relics will all once again be under the same roof. The 37 items will include the portraits of the emperor, plus paintings of his leisure hours. "It was more generous than we expected," Chou said in an article in the Shanghai-based Oriental Morning Post, adding that these paintings would help reveal the more personal side of the emperor's life, including his taste in art. According to Chou, there will be 200 exhibits at the October show, which will also include the priceless ceramic pieces from the Shanghai Museum. Nine agreements were reached between the two sides during the mutual visits, including cooperation in personal exchange, academic research, exhibitions, publications and sales of souvenirs. 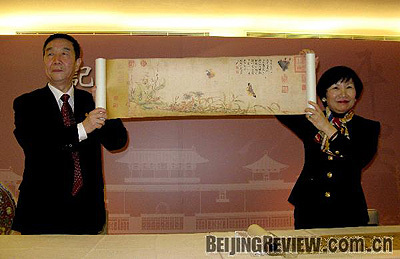 During her mainland trip, Chou and her team also visited Shanghai, discussing the possibility of holding a joint exhibition of the relics from the two museums at the 2010 World Expo Shanghai. "This is the first critical step forward in the cooperation between the two museums," Zheng told reporters in Taiwan during his visit, adding that it is the people both on the island and the mainland who will benefit from it. The high-level exchanges between the two museums have been hailed by the public across the Straits. Thousands of netizens participated in the poll conducted by the Beijing-based sina.com, one of the leading portal sites in China, on the topic. Almost 30 percent of respondents said they were most concerned whether the two museums will lend items to each other or jointly hold exhibitions. Chou said at the ceremony welcoming the mainland delegation that it was the first step of the cultural relic exchanges across the Taiwan Straits, and both sides had agreed that they would further elevate the level of mutual contact with high mutual trust and respect under the principle of not involving titles or legal problems. Culture strikes a chord in people's hearts and hence is the best medium of communication, she said. "The cultural relics of the Forbidden City are a symbol of the Chinese nation and fruits of our cultural heritage," Zheng said on the same occasion. "There are no museums like the two in Beijing and Taipei that share such close reciprocal relations," he said. According to Zheng, in the past six decades, some cultural relics kept in the Beijing museum have been lent to many exhibitions in Taiwan, and researchers of both sides have maintained close academic contact, but the landmark mutual visits this spring are the first formal official engagement between the two sides. "For the past years, both sides maintained constant academic exchanges, and researchers attended seminars hosted by each other. The two research centers of the Beijing museum have also invited experts from the Taipei museum as their specially invited researchers, and the academic articles of the two museums appeared in the publications of both sides," Zheng said in an interview with the Beijing-based China Culture Daily newspaper. He said that currently the Palace Museum in Beijing is compiling an encyclopedia about the Forbidden City, however, they still do not have the information about the relics kept in Taipei. "Without this part, the book will not be complete," he said, adding that the joint academic research is an important part of the cross-Straits exchange and cooperation. "Although I have been to the Taipei museum, along with many staff members of our museum, most of these visits were not at the invitation of the Taipei museum. We have not jointly held an exhibition before," Zheng said. The origin of the relics of both museums is the same, and they complement each other, Zheng said. He cited an example of some relics, like a set of books, would have volumes in both locations. It shows that the contact between the two sides is inevitable, and the cooperation across the Straits will present Chinese people a complete palace museum. Zheng also praised the relic maintenance work of the Taipei museum. "Some methods of preserving relics at the Taipei museum are better than those of the Beijing museum. Besides, other aspects, such as services, in the Taipei museum, are also worth learning by the Beijing museum, he added. The cultural relic exchange visits between the two museums occurred against the larger background that the cross-Straits relations have greatly improved following the opening of the "three direct links" between Taiwan and the mainland and the visits by mainlanders to the island, said Yin Maoxiang, a researcher at the Beijing-based Institute of Taiwan Studies of the Chinese Academy of Social Sciences, in his article on the official website of the academy. He said that the mutual visits and the wide-range cooperation between the two museums are beneficial to spreading the traditional Chinese culture and will strengthen the national identity of the people of both sides. "The relics of the two museums come from one origin, which is the Forbidden City, and so they all are the treasures of the traditional culture of the Chinese nation," he writes. The collections kept in the two museums are not just cultural relics, and they contain the deepest root of the Chinese culture, art and philosophy, Yin said. "The cultural and historical value of these relics belong to the entire Chinese nation and they show the close relationship in hearts and feeling between people across the Straits," he writes. 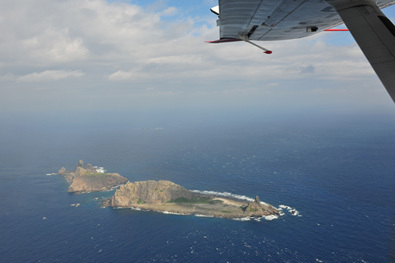 He said that it is very wise for both museums to set aside historical disputes to emphasize the traditional and historical connections of the relics, which are in turn an important part of cultural exchanges across the Straits. In the past, the contact across the Taiwan Straits mainly focused on economic and trade communication, while cultural exchanges were relatively weak, he said, adding that this move may help to change all that. On September 18, 1931, Japanese military forces stationed in the northeast region of China attacked Shenyang, capital of Liaoning Province, which led to the complete occupancy of China's northeast by Japan. 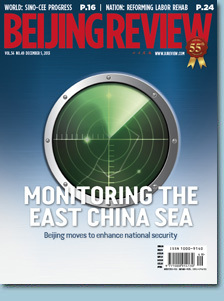 Thus, Beiping, former name of Beijing, some 200 km away from the northeast, was in danger. The Kuomintang government, then the ruling authority of China, devised a circumspect plan to save and transfer the cultural relics collected in the Forbidden City to a safer place in the hinterland. In January 1933, the Japanese army entered the Shanhaiguan Pass, the east end of the Great Wall and the gate for entering north China. On the night of February 5, relics from the Forbidden City began being transported to Shanghai. In total, there were five batches of relics, composed of 19,557 boxes. These treasures were kept in Shanghai for four years, during which 80 boxes of rare items were at one stage sent to Britain to be shown at a Chinese art exhibition held there. In July 1937, Japan waged all-out aggressive war against China. Then in August, Shanghai was occupied by the Japanese forces. Nanking (now Nanjing), then capital of China, was at the brink of the fall. The relics from the Forbidden City were transferred again, along three routes, to the home front area to avoid the ravages of war. Spanning around a decade, the transfer traversed a distance of tens of thousands of miles, involving many provinces of China such as Guizhou, Sichuan and Shaanxi. The relics returned to Nanking unharmed in December 1947, two years after the end of China's War of Resistance Against Japanese Aggression. From May 29 to June 8, 1948, the first cultural relic exhibition after the war was held in Nanking. Originally, the Kuomintang government decided to move the treasures back to Beiping. However, the civil war aborted the plan. On November 10, 1948, based on the opinion of some governmental officials, archaeologists and experts in cultural relics, the Kuomintang government decided to transfer the relics in Nanking to Taiwan as soon as possible. They also decided to transfer all the book collections and other cultural relics in Nanking at the same time. In the early morning of December 22, 1948, a transportation warship of the Kuomintang navy set off from Nanking, carrying 712 boxes of relics, of which 320 boxes of relics were from the Forbidden City. Four days later, the relics arrived in Taiwan. On January 9, 1949, the second batch of relics arrived in the island, including 3,502 boxes of treasures, of which 1,680 boxes came from the Forbidden City. On February 22, the last batch of 1,248 boxes of relics arrived in Taiwan, of which 972 boxes were from the Forbidden City. Including the relics airlifted and 109 boxes of relics that Japan returned to China, by December 1949, relics that had been transferred to Taiwan totaled 5,606 boxes, of which 3,879 boxes, with more than 250,000 pieces, came from the Forbidden City and the then central museum of China, based on which the "National Palace Museum" was later established in Taipei. Situated in the heart of Beijing, the Forbidden City is the imperial palace of two consecutive dynasties-the Ming Dynasty (1368-1644) and the Qing Dynasty (1644-1911). A total of 24 emperors lived in the palace, the construction of which was completed in 1420. Covering an area of 72 hectares, the Forbidden City has 9,999.5 rooms and is called a "sea of regal buildings." It is now the largest and most complete imperial palace and ancient building complex in China and the world. It was included in the list of World Cultural Heritages by the United Nations Educational, Scientific and Cultural Organization in 1987. Numerous precious cultural relics collected by the royal families were kept there. However, since the 1930s and 1940s, part of the valuable paintings, calligraphic works, ceramics and decorative objects of the Forbidden City were moved out of the palace and eventually transferred to Taiwan, where they remain to this day, creating a situation of one imperial palace, with two palace museums. Although the collections of the two museums have their own unique characteristics and strengths, neither of them is complete. Only combined as a whole can the two museums present to visitors a complete view of the best ancient Chinese artworks and artifacts, and a thorough understanding of the best elements of Chinese culture.